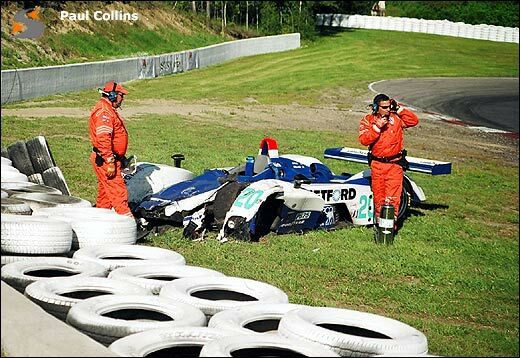 The morning practice would unfold with an easy regularity, with Mosport rookies testing out the limits of their cars in high-speed corners the likes of which many had only dreamed. Often through turns 2 and 5 a car would get wide, dragging some sand and gravel into their intakes and onto the track; rarely would there be any mistakes that were more serious than that. Piers Masarati was particularly effusive about the track's layout - "The best kind of corners are the ones you enter at 100 mph, and exit at 120." He also compared the esses from 8 to 10 favorably with the Porsche Curves. The afternoon practice was quite a thrash, and fans were really starting to focus on the individual competitors, rather than the totality of the on-track action. It was obvious that there were serious races within each class, with Butch and James, JJ and Johnny, Marco and Frank heading out and tightening up their traffic skills; the Maranellos were making it extremely difficult for the Corvettes to claim the limelight in GTS, and the AJR boys were being kept honest by Orbit and Risi / Ferri. 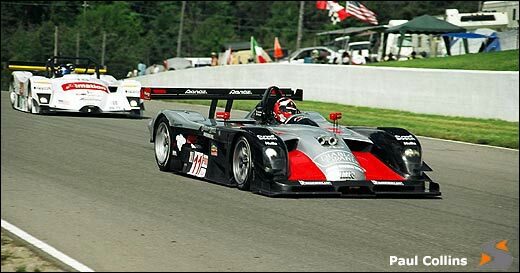 Further back, some other familiar stories were being repeated, as Panoz was showing that the drivers could hustle the cars to the tail of the lead five, but without development they would not head them. 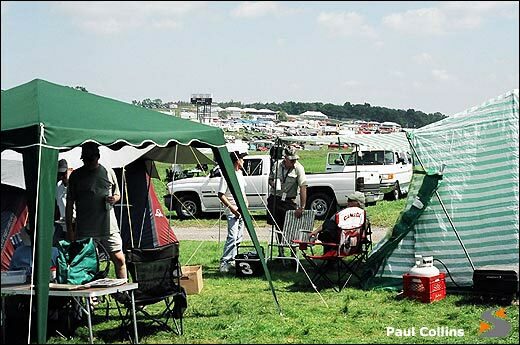 The Panoz story included the obligatory paddock thrash to get a car trackworthy for qualifying, just as Carsport would show that smaller budgets and older cars can create obstacles that can trip you up, in spite of your best intentions. The qualifying was electrifying, as readers are by now aware - delightful cat and mouse during the early parts of the sessions, followed by out and out hammering of hot laps. Ollie Gavin threw down the GTS gauntlet, and the Prodrive boys spent the rest of the session chasing. Meanwhile Mauro Baldi showed that he still had it, putting a brand new car at the head of the Ferrari pack chasing the Porsche-supported drivers. PK's best effort was sixth, exactly where they figured they'd be with the factory motor but as-yet-unsorted suspension. The #3 hometown-favorite Corvette put in its laps early, and never ventured out again. Its best time would only stand to be fourth in GTS. As Ron Fellows said, "there wasn't any point. If you don't have it in the first four laps, you're not going to get it. All you'll do is waste your tires." The team was not happy with a serious case of understeer; by 9 pm they were still working on suspension adjustments. The cap to a long day was the adopted favorites grabbing the front row. Andy Wallace put in a few installation laps on a motor fitted between afternoon practice and qualifying, while Chris and his guest Chad Block watched from Turn 2. 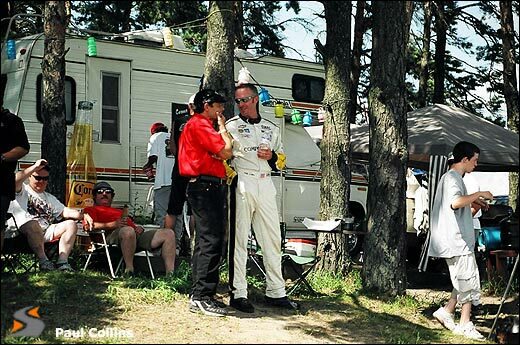 This area was pretty popular with the drivers, as Anthony Lazarro and Kelly Collins (talking together, below) and Johnny O’Connell also showed up to watch the qualifying. There were undoubtedly more, but the crowd was pretty thick. The Dyson effort to change that motor must have been "mighty," and they obviously were happy with its response - as they unleashed Andy almost immediately into the session, to chase James and seize the outside pole. Knowing what times James was turning, it was obvious that Andy was doing his best to match, as they were nose-to-tail throughout the quick portion of the session, and Andy wasn’t losing ground. The GT and GTS cars seemed to have gained substantially compared to last year, but the prototypes were definitely slower. The ACO-mandated 10% power cut has obviously worked, as the best LMP900 time was 1.5 seconds off the lap record of last year, with very similar track conditions. Interestingly, they don’t look any slower, but that’s probably because they still corner with the same level of downforce. One of the things we noticed was that the motors do sound different, particularly the Audi, which isn’t as smooth and quiet as it has been previously. Its engine note isn’t nearly as ‘breathy’ as in years past, which implies that the lack of development of the motor to address the new restrictor has definitely left some horsepower on the table. Saturday night, the crowd mostly receded to their campfires, and the sound of stock cars drifted over the track from the west. Mosport has seen larger crowds than we had this night, but not since the mid '70s. Tom Kjos likes to refer to this track as "Sebring of the North," but I can't believe that the partying down south during Spring break is this well-behaved. That said, I can remember Saturday nights in the 70s when the “Stereo Wars” would be raging – and one of our camp members was an active participant in that, with the heavy power consumption and the commando raids to sabotage their competitors. These days, the campers tend to keep their music confined to their site, with some traveling between fires. It’s like a house full of kitchen parties. Sunday’s sun rose on a cool track, with our crowd awaking to imported muffins and coffees. Our regular Sunday breakfast chefs had planned eggs benedict, but the blackout had robbed us of all available eggs. It wasn’t our ideal breakfast, but it was there when we awoke, which counts for something. Some of us decided to trek out to Moss corner to watch the warmup, and were treated to seeing some great traffic action, as all the cars were getting used to watching each other, finding their brake points, getting out of the way, and generally not overdoing it. This section of track has extreme changes in topography, plunging down a hill from 4 into a valley and then climbing what feels like about a 30 degree slope back uphill to Moss corner. My first experience at this track was for the 1971 Canadian GP in the rain, and Jackie Stewart and Ronnie Peterson were chasing through there nose-to-tail, Peterson in the March 711 with the tea-tray wing. Back then, cars would powerslide to maintain their speed; today’s cars aren’t meant to be driven with the lurid slides Peterson treated us to that day, when he’d carry it all the way down the hill from 4, only to flip the car around and start sliding the other way through Moss. To illustrate the way cars (and drivers) these days don’t powerslide, consider the Lola-MG crash Sunday morning. Andy Wallace came in hot, had his brake pedal go to the floor, and by the time he pumped it up to get some brakes, the car was too far in. He clipped the start of the curb, launched the nose up a bit, and when he came down, skidded nose-first right off the track and into the tires. The car never changed attitude or direction once Andy lost the brakes, but he wasn’t on a line that would have allowed him to throw the car sideways anyway. I didn’t think the car was going to be salvageable in time for the race; as it turned out, they just barely made it. The race was excellent, and as advertised. Unfortunately, we were robbed of our privateer favorite midway through the race, but the battle to get their second car (should we just call it their “other” car?) repaired in time ultimately paid off. Corvette’s adjustments put #3 back into the hunt, and as we now know, ALMS pit stops have to be absolutely perfect. 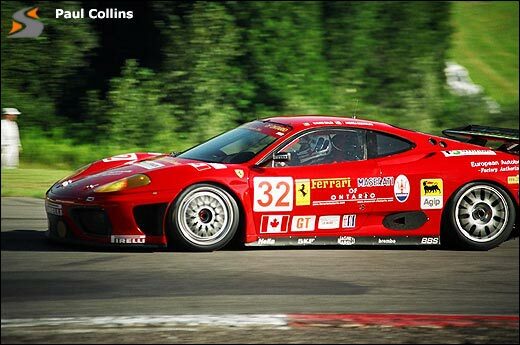 The work of Johnny O’Connell for the last 10 laps with a Prodrive Ferrari right on his tail reminded us of the battle the same driver had with the Oreca Viper back in 2000 – except that year he got passed by Wendlinger (IIRC) by leaving the line open in 10. He exhibited no such lack of defensive driving this time, and it was a well-deserved (and popular) win. Champion took up the battle for first where Dyson #16 left off, and were it not for a racing incident at turn 8, it would have gone down to the wire. From our perspective it looked like the Pabst Porsche turned in on Johnny Herbert, but I’ve reviewed the tape and it appears to me that while Pabst started to turn in, he did in fact correct to open up the line for Johnny. Johnny ended up leaving too much space between the cars, hit the curb and then slid into Pabst. It was an unfortunate end to a great race. It’s unfortunate that Scott Maxwell finished two laps back of the leaders, albeit in third place overall (second in class). Panoz made a brave call on the first pit stop, changing drivers, but immediately after Gunnar got up to speed, they had to pit again under the next yellow. This set them back almost a full lap, and precipitated the gamble on the last pitstop, attempting to gain the lap back by staying out under yellow while the leaders pitted. As we now know, that attempt failed, and they then had to stop under green, costing them another lap and possibly a step on the overall podium. I still haven’t found out what caused them to take that extra pit stop. Was it a penalty, or something that was wrong with the car? Beretta and Saelens were extremely quick during the race, and had another yellow come out in the closing stages, we might have been treated to a Panoz truly chasing the Audi. It would have been just like old times. I’ve heard that the television coverage was stellar, too. All that we need is for the people who watched that race to convince their friends to join them next time such an event is on.